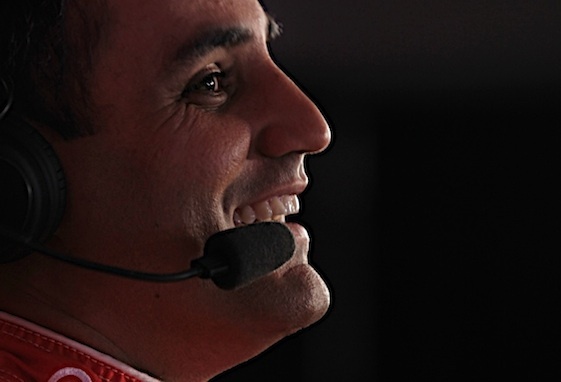 BROOKLYN, Mich. – After posting just five top 10 finishes in 22 Sprint Cup starts this year, Juan Pablo Montoya received official notification earlier this week that he won’t return to Chip Ganassi’s No. 42 in 2014. Montoya saw the writing on the wall earlier this year when the team chose not to exercise an option to retain him for an additional season. The Bogota, Colombia native told a huge contingent of media on Friday at Michigan International Speedway that he’s open to nearly any future opportunities, including the IndyCar Series. “I want to be in a winning car,” said Montoya, whose two career NASCAR wins have come on road courses. “Whatever else I do, don’t know what I’m going to do, I want to make sure I’m in a winning car. Montoya’s impending exit from the No. 42 rekindled talk about how successful drivers from open wheel series tend to struggle in NASCAR. “For me, I feel you need five years to really know the tracks and the cars,” said five-time Cup champion Jimmie Johnson. “You kind of get to a spot where you’ve got the experience and there are many reasons why things might not work. “I firmly believe in the relationship between the driver and the crew chief is where the magic lies, especially once you’re past that five year mark. Nationwide Series regular Austin Dillon will substitute for the injured Tony Stewart in Sunday’s Pure Michigan 400. Dillon and Stewart-Haas Racing competition director Greg Zipadelli met the media on Friday and discussed the timeline for Stewart to return to competition. “I’m working under the assumption that he’s out for the next month or so or longer,” Zipadelli said. “He went to the doctor this week and had a decent visit. No setbacks. “Basically, very simple instructions, stay in his bed with your leg up over your heart for the next seven days and then come back and see me. We’ll reevaluate you and tell you what you can do. Longtime NASCAR team owner Jack Roush was making the rounds in the garage and hospitality suites on Friday at his home track. After turning 71 in April and surviving two private airplane crashes during the past decade, how much longer with the “cat in the hat” be involved in with his three-car organization? His two veteran drivers, Greg Biffle and Carl Edwards, expect Roush to be around for years to come. “I think it will be a long time before he is not at the race track every weekend,” Biffle said. “The technology is changing so Jack is still involved and he has less of a role, but so do we almost because technology has taken over a little bit. “It’s his team and he is the leader,” Edwards said. “It is nice to have that leadership, so I don’t want to see him step back. The NASCAR television landscape will have a new look on Saturday when Speed is converted to Fox Sports 1. The new network will focus on a variety of sports, including motorsports. But several popular racing programs will be axed. “It’s unfortunate to lose some (motorsports coverage),” NASCAR driver Kyle Busch said. “I’m not sure how much we’re losing. I think we’re still keeping most of the Speed NASCAR coverage the same on Fox Sports 1. I think the two shows that I saw this past weekend, last Sunday that I’ll miss is of course ‘Speed Center’ — ‘Speed Center’ is awesome. You get to watch and see and get the outcome of races across the world in 60 minutes. I think that program is awesome and then Dave Despain’s show, how with having the fan interaction on ‘Wind Tunnel’ is also a cool show.